We’ve all done it. We give ourselves an hour to get in a workout, then end up wasting nearly half of it — running an errand or two, getting dressed at the gym, chatting with acquaintances we bump into along the way. Even with the best intentions, you can sidetrack your progress if you don’t make good use of your time. Think you might be frittering away precious fitness time? Check out what three fitness experts identified as the top 10 fitness time-wasters, and see where you can improve. When it comes to strength training, doing too many repetitions with lighter weights equals wasting time. “When we’re trying to build strength and build muscles, we want to attack as many muscle fibers as possible,” explains sports conditioning coach Fiona Lockhart. That means upping the weight and decreasing the reps: “Fifty biceps curls might build muscular endurance but you’re not going to build the strength you’re looking for,” Lockhart says. Of course, it also takes a lot more time to do 50 reps with light weights than 10 to 15 reps with more weight. If you haven’t been this person, you’ve seen her — wandering from machine to machine with the 100-yard stare of someone whose mind is elsewhere. Don’t just do the exercise; do it right, says Fabio Comana, MA, MS, certification and exam development manager for the American Council on Exercise. Improper exercise technique not only poses a greater risk of injury to muscles and joints, it also wastes your time. You may be thinking you’re strengthening one muscle when in fact you are straining another or stressing a joint. 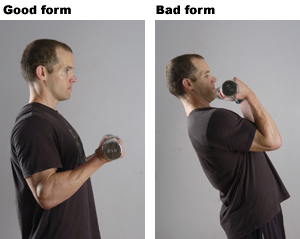 For example, doing bicep curls with your knees hyper-extended and your back muscles shortened could do more harm to your knees and back than good to your arms. Fitness trainers or floor assistants are on hand at most gyms to assist you with proper form. Use them. Ask for someone to walk you through the equipment, showing you proper technique with machines and free weights. “Social support is great,” says Trese. “Knowing that a familiar face will be there at the same time” can keep you going with your exercise regimen. “But you don’t want to make it just a social hour.” When walking on treadmills with a companion, Lockhart suggests agreeing to chat during the warm-up and cool-down, but to stay quiet and commit to pushing yourself for the time in between. “Work at an intensity that burns significant calories and is too high to carry on a full-blown conversation,” Lockhart suggests. When you work out with a friend or friends, set some rules first to be sure everyone stays on track with time, Trese advises. Try doing 8 to 10 exercises in 30 minutes, and resting no longer than a minute between exercises. 5. Getting Stuck in a Rut. To add intervals, increase incline or speed for short periods during cardio exercise, says Trese. With your strength routine, change the order of the exercises or rotate from machines to free weights. “With more versatility, your muscles won’t be prepared and your body will not automatically know how to respond,” Trese says. This will keep things fresh for your mind, too, she says, “making workout routines less boring.” Lockhart advises varying your exercise program every six to eight weeks if you’re working out consistently. This is enough time for the body to benefit from the routine without getting complacent. “People tend to get on cardio equipment and think they’re paying the piper, but they’re so into their book they’re wasting precious caloric time,” says Pillarella. The bottom line is that when you’re focused on other things, your workout suffers, she says. You can walk at a 4 mph pace for 45 minutes and burn 300 to 400 calories, says Pillarella. But you could get the same calorie burn in 20 to 25 minutes doing intervals (running or walking as fast as you can for a minute or two) every 90 seconds. “It’s the total number of calories burned that counts,” she says. If you need a diversion to make it through your session on the elliptical machine, try music, suggests Comana. Invigorate your workout with a fresh mix on your iPod instead of spending your time staring at the crawl on Fox News. “Music can inspire you to pick up the tempo,” Comana says. The machine you want to use is occupied, so you grab a towel, get a drink of water, run to the bathroom — and the next thing you know, 10 minutes have passed. To avoid such time-wasting, rest only 30 to 90 seconds between strength exercises, says Comana. To maximize time, alternate a set of exercises for your biceps with a set for triceps, he says. That allows you to shorten the rest interval in between — while one muscle group is working, the opposing group is getting active recovery. How can you fit in separate exercises for your biceps, triceps, deltoids and lats when you only have 30 minutes to work out? For body-builders, concentrating on two or three muscle groups per session might be fine, but this doesn’t work for the average person. There’s not enough time to get to all the muscle groups in three 30-minute sessions a week. Instead, says Pillarella, choose exercises like squats and push-ups that target several muscle groups at once. You’ll get a better workout in less time and you’ll also be training more functionally (mimicking the way you use your body in daily life). 9. Changing Clothes at the Gym. Dressing at the gym can be a big time-waster. Change before leaving work or the house and you’re less likely to change your mind about working out once you hop into the car, Trese suggests. You’re also less likely to get into a conversation in the locker room that could shave 10 minutes off your workout. “Some people even go to the extreme where they wear their workout clothes to bed so they can just get up and go,” says Trese. If you don’t like the idea of sleeping in shorts and T-shirt, try laying out your workout clothes the night before to save time in the morning. 10. Waiting until Afternoon to Work Out. With determination, it’s possible for late risers to fit in regular afternoon fitness sessions. But there’s no question that people who work out in the mornings are more likely to stick to their routines, Trese says. There’s less time to make excuses, and fewer things to get in the way of a workout. If you promise yourself a 4:30 p.m. walk, it’s much more likely something will come up, Trese says. Before you know it, it’s 5:30, and you’ve missed your window. Waiting until late in the day, “is setting you up for a downward spiral,” she says.